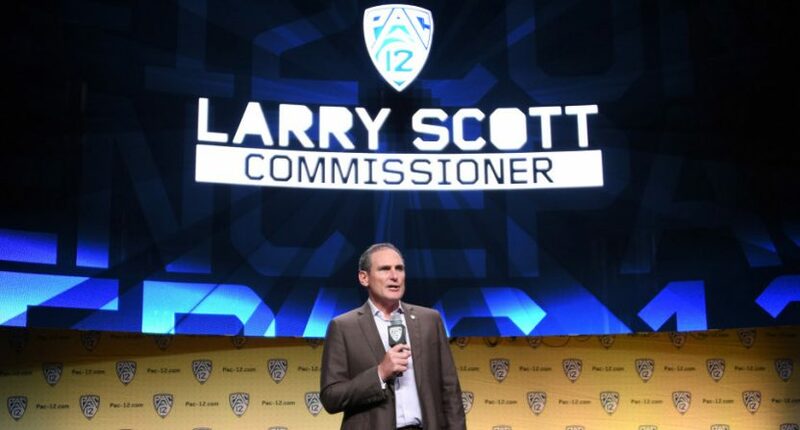 Pac-12’s Larry Scott looking to squeeze more money for media rights, but can he? The Pac-12’s current media rights expire in 2024, but will it get a huge rush from the networks? The Pac-12 Conference is like that odd relative at your family holiday gathering. You have to invite them, but then you have no idea what to talk about when you’re left alone. The league, which calls itself the “Conference of Champions,” has been lagging behind the other conferences in revenue. It’s hoping to get more money from either a network or tech company partner when its media rights go up for bid before the 2023-24 season. While that’s a nice sentiment for a league that has had a lack of success in football, that might be an odd stretch. When you think about the money that the league has spent not only on Commissioner Larry Scott’s salary and on overhead for its in-house Pac-12 Networks, it has not translated on the field and in the money paid out to member schools. One positive for the Pac-12 has been its late night football games on both Friday and Saturday nights, but they’re not popular with its coaches. However, networks prefer massive audiences in primetime from 7-11 p.m. ET, not when games run until 1:30 a.m. Getting a huge increase in cash from the networks may not be in the cards, especially when ESPN and Fox are the main players in college sports. The Pac-12 has an advantage over peers, however: It’s the only collegiate sports conference to wholly own its own media company. That puts the organization in a strong position to capitalize on the insatiable appetite for live sports when the current deals expire in 2024, Pac-12 Commissioner Larry Scott said in an interview. But having complete control doesn’t necessarily translate into eyeballs. The lack of distribution with AT&T (DirecTV and U-Verse) is hurting the conference, and both the Big Ten and SEC are now far ahead of the league in revenue, while the ACC is about ready to leapfrog the Pac-12 when its network launches later this year. Larry Scott can talk about the Pac-12 being the “Conference of Champions” and a resurgence in basketball (that already seems to be over), but where it counts is football. The conference’s lack of success in breaking through into the College Football Playoff is sticking in the craw of its member schools. However, in reality, there may not be the bull market that Scott is looking for. While the NFL, MLB, NBA, Big Ten, SEC, and even ACC are desirable commodities, the Pac-12 can’t be put in that group due to its inventory. Scott is referring to direct-to-consumer products and partnering with the tech companies as the next phase for the league, but observers point to the lack of demand for the Pac-12 Network with DirecTV as a narrative for its lagging behind the other conferences. The Pac-12 can hunt for new revenue streams and new partners, but if Larry Scott thinks he can play networks and tech companies off each other in hopes they’ll want his league’s content, he may be in for a rude awakening. The year 2024 isn’t too far off and Scott may again be looking to China and Canada to help offset what may not be here in the United States.